Angelina Escobar, is the first winner of BEAR BRAND Powdered Milk Drink’s Hakot Papremyo promo, the free shopping spree offered by BEAR BRAND Powdered Milk Drink to all its loyal customers. Together with her daughter and son-in-law, Escobar spent her winnings at Cash & Carry in Makati City, loading up cartfuls of BEAR BRAND Powdered Milk Drink products and other grocery items within two full minutes of shopping time and with up to P15,000 to spend. Escobar, a 66-year-old homemaker, was among hundreds of participants who joined the promo by enclosing in a legal-sized envelope P100 worth of any combination of Bear Brand Powdered Milk Drink, Bear Brand Choco Powdered Milk Drink, or Bear Brand Busog Lusog Family Cereal Drink. With the participants’ names, contact details, age, and signature, the envelopes were dropped at 127 drop boxes in participating supermarkets nationwide. Escobar admits to being a long-time BEAR BRAND Powdered Milk Drink user, and has even raised her children on the values it advocates. “Sa tulong ng sustanyang hatid ng gatas, tinuruan ko silang maging masipag sa pag-aaral para magtagumpay sa buhay,” she said. Jasmin Estacio, consumer marketing manager for BEAR BRAND Powdered Milk Drink, said, “We hope that in our small way, we were able to help Nanay Angelina and her family. 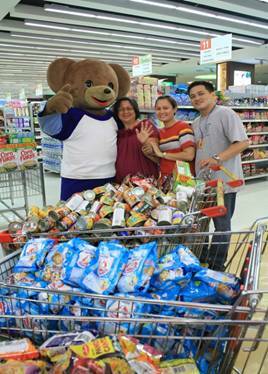 BEAR BRAND Powdered Milk Drink has always been committed to helping whole families strengthen their bond through affordable, nutritious and delicious resistensya-building drinks.” The BEAR BRAND Hakot Papremyo promo ends October 31, 2012. 250 more lucky participants will be picked to join in the two-minute shopping spree. Visit leading supermarkets for more details on how to join.